The roots of Sacred Heart of Jesus Catholic Church reach back to the middle of the 18th century. Although records of the time are scarce, it is known that the first Catholic missionary, Father Didier, came to the plantation of Sieur Courtableu in the Opelousas country in 1756. Early records show that a mission church, served by the Opelousas country, was situated on the corner of the present Evangeline Bank property at Main and DeRouen Streets. According to legend, Santa Anna, who defeated the American Revolutionaries at the Alamo, was later defeated by Sam Houston at San Jacinto in 1836 and was taken to Washington, D.C. by Federal troops. On their journey, the soldiers escorting him camped on the church grounds. On December 6, 1845, while Ville Platte was still part of St. Landry Parish, the Reverend Jean F. Reviel, pastor of the St. Landry Parish Church in Opelousas, received a parcel of land donated by Edouard Dardeau and Martin Rousseau, both from Ville Platte. This property, to be used for the construction of a Catholic church in the Ville Platte vicinity, measured 118 feet facing the public road from Opelousas to Bayou Chicot, with a depth equaling two arpents, bounded on two sides by the donors. The contract stated that this land was to be used strictly for church property. In 1854, after the above land donation, Archbishop Blanc of New Orleans set up an independent church parish of Sacred Heart of Jesus. The years 1854 to 1878 saw a succession of French missionary priests serving the parish. The first resident pastor, Father Berguire (Beauguire), recorded the first baptism, that of Joseph Bouler (Buller), son of Arcacius Bouler and Adelaide Johnson, on July 9, 1854. According to church records, the original handmade altar used in the first church was discarded when the second larger and more ornate altar was installed. 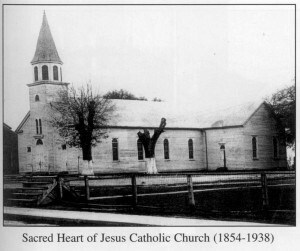 In 1856, the resident priest was recalled, and Sacred Heart Church again came under the care of the St. Landry Church with Father Gilbert Raymond as its missionary priest. On December 12, 1860, a bell donated to the church in memory of Merrie Aimee (Amy) was solemnly blessed by Father Raymond in Sacred Heart Church in Ville Platte. It was not until 1860 that Ville Platte had another resident priest when Father Genelory was assigned to Sacred Heart. The following year he was replaced by Father C. Rigolet, who in turn was replaced by Father Rene Ville who ministered to the Ville Platte congregation until 1868. In 1865, a donation to the Ville Platte church by the estate of Hycinthe Vidrine, second wife of Marcelin Garand, included a plot of ground situated in the vicinity of Joseph L. Fontenot on the north, the Catholic church graveyard on the south, and the public road leading from Ville Platte to Chataignier on the west. On February 20, 1866, Marcellus McDavitt donated six arpents of land to the Roman Catholic Church for church and educational purposes only. This property included a half-arpent cemetery which McDavitt reserved until 1875. He then donated this parcel of land as a Protestant cemetery which became known as the “Shaw Cemetery.” This piece of property on Pine Street is still in the midst of the Sacred Heart Church property. In 1865, one out of every eight parishioners at Sacred Heart were African Americans. All Blacks were Catholic at this time. After the Civil War, Baptists began their missionary work among the Black population. At the time, there was little interest given to Black Catholics; and as a result of this neglect, they felt estranged and began to turn to the Baptist preachers, churches, and Sunday schools. Some, however, remained faithful to the Catholic Church, even walking from the Faubourg area northeast of Ville Platte for many years to attend Sunday Mass. Father Louis J. Savy became pastor of Sacred Heart Church in 1910. He was a big man, literally and figuratively, free from petty prejudices and without fear of bigots; but he could not stem the tide of Black Catholics leaving the Church. To accommodate this segment of the Sacred Heart parishioners, a new church was established in 1946 by the Josephite Superior, Father Edward Casserly. Through the intercession of Father Gilbert Bemers, pastor of St. Mathilda Church in Eunice, five acres of land were purchased in what was called “The Woods” in Ville Platte. He had an Army chapel from Fort Polk moved to the site and Father Auclair became the first pastor of the new St. Joseph Catholic Church. On September 1, 1978, to alleviate the lack of priests in the diocese, the Reverend Mr. Jonas Mason (Deacon) was named administrator of St. Joseph Catholic Church by Bishop Frey, to serve the 132 families in the parish. In 1996, Rev. Mr. Roderick Perron (Deacon) was Parish Life Coordinator and upon his resignation, Father Robert Romero, Pastor of Sacred Heart Church, assumed the duties as Canonical Pastor of St. Joseph Church. Since this time St. Joseph Church has been served by Sacred Heart priests. Sister Christina Marie Griggs, O. Carm., Pastoral Associate at Sacred Heart, served at St. Joseph Catholic Church also. St. Joseph Church is currently being served by the Sisters of the Holy Family, founded in New Orleans by Servant of God Henriette Delille. Among these dedicated women are Sister Clara Jackson and most recently Sister Rita Darensbourg. During the next decade, Father Ernest Forge (1868-1873), native of France, and Father Eugene Fraering (1873-1878), native of Prussia, served in Ville Platte. On October 17, 1874, a land grant was donated by Joseph Landreneau, Sr. to Archbishop Napoleon Perche of New Orleans, and it was given to the presbyters of Ville Platte. This parcel of land, located near Ville Platte, forms a triangle, having to the north the public road going to Opelousas, and to the west, land belonging to the donor. This land measured 150 feet on the public road and 165 feet on the west. Succeeding Father Fraering in 1878, Father P.L. Ponsier remained at Sacred Heart until his untimely death from a shipwreck while on a journey to his home in France in 1898. He was then replaced by Father Henry Chastel of France who remained pastor until 1910 when Father Louis Savy (1910-1930), also from France, became pastor of Sacred Heart and continued the significant strides begun by Father Chastel in the growth of the church parish. The church building was enlarged by adding wings on the east and west side of the building, and the Stations of the Cross were erected. In 1912, he had a chapel constructed in Mamou. In 1914, he built cement sidewalks around the church and school and had new pews and a confessional installed. 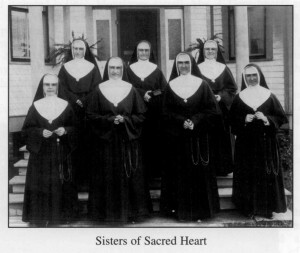 Also, during Father Savy’s administration, in 1913, the Sisters of Mount Carmel from Washington, Louisiana, opened a convent at Sacred Heart that remained in existence for ten years (1913-1923) but had to close because of financial difficulties and friction that developed with the pastor. Probably the most memorable incident in his tenure was his ministry involving the anointing and burying of the dead as the result of the dance hall fire of November 19, 1919. Sixteen bodies were arranged in the Sacred Heart parking lot at the time, with friends and relatives attending the funeral Mass. In 1930, at age 31, Father J. Maurice Bourgeois, after serving in Abbeville and Oberlin, was sent to Ville Platte to replace Father Savy. Upon his arrival on September 11, 1930, he found buildings in much need of repair, a cemetery neglected and overgrown with weeds, and a rectory bare of all furnishings. Despite this dilemma, his administrative ability was equal to the task as he forged ahead and challenged all obstacles as they came up. Two days after his arrival, he baptized two new parishioners, Joseph Willis Smith, son of Adam Smith and Evelyn Soileau, and Alice Lou Bertrand, daughter of Magnus Bertrand and Lena Vidrine. All spiritual life in the parish was being taken care of, so he then focused on administrative duties and organized a church fair which netted $895.15, the beginning of good things to come for the parish. In the following months, plans were laid for the reopening of the parochial school and rebuilding of the convent. The citizens of Ville Platte met the appeal for funds with generosity and enthusiasm. By August 1931, plans were underway. Carpentry crews from G.J. Deville and Ludeau’s lumber yards worked on alterations of the school and convent; local farmers leveled the grounds and arranged for drainage; and two hundred women of the parish gave needed items to furnish the sister’s home. On August 29th of the same year, the Sisters of the Sacred Heart from New Brunswick, Canada, arrived to staff the school. The Sisters included Mother Superior Albina, with Sisters Mary Loretta, Elizabeth, Geraldine, Jeanne Francoise, Paulina, and Delores. When the school opened in September 1931, there were 100 students in grades one through six. A seventh grade class was added in 1933-34 and the first seventh grade graduation was held at the Dardeau Opera Hall in mid­town Ville Platte. Valerie Lafleur (Soileau) was the valedictorian of that graduating class. The eighth and ninth grades were added in September of 1934. At that time, the elementary school was awarded state certification. Accreditation would be sought for new levels added. In 1936, a kindergarten program was added, tenth and eleventh (senior) grades in 1938-39 and the first High School Graduation consisting of 14 students was held in the “new” church in 1940. Those graduates were: Ruby Nell Demoruelle (valedictorian), Mildred Guillory, Evelyn Fontenot, Inez Dupre, Allen Fontenot, Paul Ortego, Icy Soileau, Lawrence Fontenot, Eva Sylvester, Dale Fuselier, Katherine Vidrine, Dottie Bell Guillory, Hicks Young, and Anna Belle Latour. Presently (2012) the Sacred Heart School enrollment stands at 750 or so students. 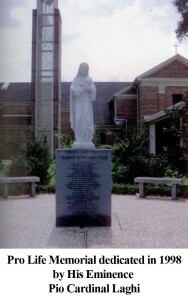 The Canadian Sisters left Ville Platte in the late 1930’s when the Marianites of the Holy Cross took over the school until 1987. Today the school is staffed by lay teachers and administrators. Father Bourgeois involved himself in civic organizations and was instrumental in organizing the first parish library and the first Boy Scout Troop in Ville Platte. He was among the first to complete the Scout Troop Leader course in Opelousas in 1936. Each spring, a two-week mission was held at Sacred Heart … one week in English and the second week in French. Since 1952, all missions have been in English. Father Bourgeois’ main preoccupation was with making the church a fitting setting for the spiritual life of his parishioners. Therefore, in 1933 a noted Lafayette artist, J.W. Zelm, was engaged to decorate the interior of the old church. Faux-finish marbleizing was used on the bare walls making them resemble white marble with Moorish inlay effects; wooden pillars were painted to resemble stone with a phoenix and peacock symbolizing ritualistic splendor; and colored glass windows were installed to alter the atmosphere of the old bam-like building. Church fairs and other fund raisers were conducted annually, and in 1936, the building fund stood at $20,000. With an additional $15,000 loan, the “shell” of a new church and rectory was underway. On December 8, 1938, a host of visiting priests and dignitaries assembled in Ville Platte with Bishop Jules Jeanmard for the dedication of the new brick church. Though incomplete on the inside, the principle structure was there. The bishop’s mandate when he sent Father Bourgeois to Ville Platte to “RENEW SPIRITUAL LIFE, TO REOPEN THE CATHOLIC SCHOOL AND TO BUILD A NEW CHURCH” had been accomplished. In 1935, Monsignor Bourgeois hired Elie Jack as a full-time custodian at Sacred Heart. He was a quiet, gentle man, loved by all of the Sacred Heart students, and he remained at Sacred Heart until 1970. He died in 1978 and is buried in the Sacred Heart Cemetery. With the construction of the new church building in 1938, the “old church” was used as a multi-purpose building: as a basketball court, band hall, football locker room, and boxing ring. The west wing was made into a stage for plays and other school activities. The east wing was used as a sort of mattress factory during World War II. This building was demolished in 1942 to make room for a larger parking lot for the church and school. In 1936, a new system of church finance was initiated. Instead of renting pews by the year, each adult paid $.10 and children $.05 upon entering the church as a voluntary charge or donation. The weekly offertory envelope donation system was introduced in the 1950’s and is still used today. Through this system, all donations are recorded weekly. A “red-letter” day for Father Bourgeois, and for Ville Platte in general, was April 24, 1938, when a newly-ordained priest named Fr. Irving A. DeBlanc assumed his duties as the first assistant pastor in Ville Platte. Equally enthusiastic in his ministry, this marked the beginning of a long and fruitful association for the two priests. Both taught classes at Sacred Heart School for a few years to relieve the burden of the addition of the high school department. Father DeBlanc saw to it that students received a bonus educational boost by organizing football, basketball and boxing teams; a band, sodality, elocution classes, and spearheaded a drive for the first public Library in Ville Platte. With that “Do or Die” spirit, he and Coach Raoul Landry produced football teams that won two State championships and numerous District championships. After World War II, using Army surplus buildings along with donated materials from local contractors and volunteer labor, a new high school department and gymnasium were built. On March 3, 1940, Bishop Jules Jeanmard, Bishop of Lafayette, and Father J.M. Bourgeois, Pastor of Sacred Heart, along with his assistant, Father Irving DeBlanc, officiated at the dedication and blessing of the new Sacred Heart of Jesus mission chapel in Belaire Cove. It was built on a three-acre tract of land at the cost of $3,000, with a seating capacity of 300. For decades since the 1950’s, Mrs. Irene V. Fontenot was the unofficial custodian of the chapel. Slowly over the years, the parishioners of this small rural community have had fund raisers to establish a mausoleum and church hall, which were built in 1986, and to beautify the interior of the church and grounds. After all these years, this mission church still remains under the administration of the priests of Sacred Heart of Jesus Parish in Ville Platte. In 1940, a large crucifix with metal sculpted figures of Jesus and Mary Magdalene at the foot of the cross was erected on an elevated cement base in the rear of the Sacred Heart Cemetery. This was donated by Mr. and Mrs. Emile Ludeau as a memorial for their son, John Lawrence Ludeau. In 1941, Mr. and Mrs. O.A. Rozas donated two more statues, one of the Blessed Virgin and one of St. John, as a memorial for their godchild, Millard Guillory. These statues were set on pedestals on each side of the cross. 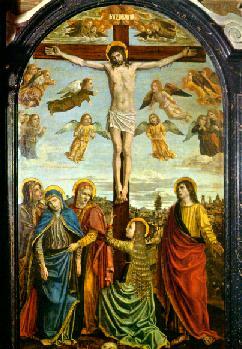 This completed the beautiful Calvary scene which has enhanced the solemnity of the cemetery since its construction. In 1943, Father Bourgeois was named a Domestic Prelate with the title of Rt. Rev. Monsignor by Pope Pius XII. On November 25 of that same year, he was also honored as a Papal Knight of St. Gregory. In addition, he was elevated to Fourth Degree Knight, the highest degree of the Knights of Columbus, an organization dedicated to church work and charitable work in the community. In 1946, Msgr. Bourgeois attended the canonization ceremonies for Mother Frances Cabrini in Rome. He carried the canopy over the papal chair during the procession into St. Peter’s Basilica before the canonization ceremonies began. Father Irving DeBlanc, Assistant Pastor at Sacred Heart, beloved by the people of Ville Platte for his friendship, dedication, and tireless devotion, was appointed pastor of Our Lady of Wisdom Chapel at the S.L.I. (the present University of Louisiana at Lafayette) chapel in Lafayette in 1950. Father Jules Speyrer replaced him as assistant pastor in Ville Platte. In the mid-fifties, a temporary chapel was set up in a vacant store on South Soileau Street on the southwest side of Ville Platte, belonging to Adam J. Vidrine, for Sunday Masses. The purpose of this was to accommodate the elderly who had no transportation to Sacred Heart Church. The chapel closed when the owner decided to reopen the store for business. The 1950’s brought about many changes in the Church. The Vatican gave permission in 1959 to have Saturday evening masses (anticipated Masses) for the benefit of the aged and people who worked during Sunday Mass hours. In 1957, plans were being made for the renovation of the church interior, a convent for the Sisters and a new elementary school. To accommodate a larger playground for the school, Mrs. Jean (Doris B.) Vidrine, whose property adjoined Sacred Heart property, donated an acre of land to square off the church property line. This all began with a special drive in April 1957 to raise funds for the project. The sacristy was enlarged, a new marble altar backed with a beautiful mosaic depicting Jesus appearing to St. Margaret Mary Alacoque, and a skylight above it was installed. Stained glass windows depicting events in the life of Jesus were installed, and new statues of Mary (Our Lady of Fatima) and St. Joseph were ordered. Stucco walls, acoustical ceiling tiles and new air conditioning and heating systems were installed. A bell tower was constructed on the northeastern side of the church and equipped with an electronic bell system. A choir loft was also added in the mezzanine which increased the seating capacity by 90 persons. A new electronic organ was donated by Mrs. Rose Vidrine and small statues of the four gospel writers, Matthew, Mark, Luke, and John were installed on shelves on the four pillars in the center of the church. A new Baptismal font, which matched the altar, was donated by Mr. and Mrs. Earl Jeffries and Mr. Jeffries was the first person to be baptized using the new font on May 14, 1959. While Monsignor Bourgeois was on an extended vacation, his assistant, Father Hermann Barsen, suggested to a group of Monsignor’s friends a gift of the 14 Stations of the Cross for the new interior of the church. This was on Sunday and by Tuesday afternoon, the stations, at $150 each, had all been donated, with $350 more for “little extras” . 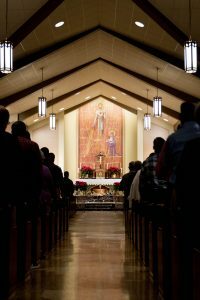 During the extensive renovation of the church, Mass was celebrated in the Sacred Heart High School gymnasium for two years. The renovation work was done by Exland Construction Company of Bunkie, LA, at a cost of $160,000. His Excellency, Most Reverend Maurice Schexnayder, who succeeded Bishop Jeanmard, came to Ville Platte to bless the newly-completed church, convent, and elementary school on Sunday, November 6, 1960. At this time, the Catholic Daughters, whose local organization was begun by Msgr. Bourgeois in 1954, presented him with a leather-bound book containing pictures and story of each scene depicted in the stained glass windows of the newly-remodeled church. 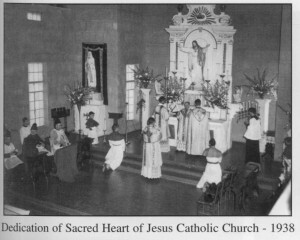 In 1961, the new Bishop of the diocese of Baton Rouge, Robert E. Tracy, visited Sacred Heart to consecrate the new side altars of Mary and St. Joseph. On February 16, 1968, tragedy struck Sacred Heart when the high school and gymnasium, built in 1946, burned to the ground. Within one hour, the home of the Sacred Heart Trojans was a mass of flames, one of the biggest fires in the history of Ville Platte. The teary-eyed pastor and his people watched as the work of 20 years became a pile of rubble and ashes. The Lord had spared His people the lives of the students who had, only hours before, been at school. Only four days after the fire, plans were in the works for building a new school; and within 15 months, a new high school was built and dedicated. The large cross erected on the apex of the burned building was salvaged, restored and attached to the main entrance facade of the new high school building. Also erected was a plaque which reads, “In testimony of the faith of the people who rebuilt the present high school building, to the memory of Chester Vidrine who made the cross, and to the love of Monsignor J.M. Bourgeois for Catholic education”. 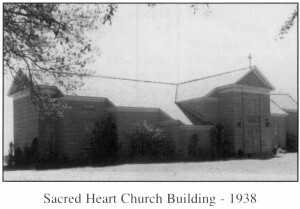 In 1969, Sacred Heart Church Parish was divided; and Our Lady Queen Of All Saints Parish was created with the appointment of Father Robert Sibille as its first pastor. Just as in 1946, with the establishment of St. Joseph Church, Sacred Heart Church lost parishioners. Members of Sacred Heart Parish were reassigned to the new church parish. The boundaries were set from Soileau Street to the northern and western parts of the parish bordering Pine Prairie and Mamou. Our Lady Queen Of All Saints Church was housed in a former skating rink until funds were available to build a church. A ten-acre parcel of land was donated to the new church parish by Mr. and Mrs. Leonard Dardeau. The church building, situated on Dardeau Street, was completed in 1973 when Father Joseph Brennan was the pastor. On April 30, 1970, Monsignor Bourgeois stepped down from forty years of service as Pastor of Sacred Heart of Jesus Church Parish. He retired because of poor health and died on June 14, 1978, fifty-four years to the day of his ordination into the priesthood. He is buried in the old Sacred Heart Mausoleum. His chalice, embellished with a gold cross on the base, with his mother’s diamond in the center, is used occasionally at Sacred Heart Church. Monsignor Bourgeois was succeeded by Father Edward Fruge (1970-82) who was named a Prelate of Honor, thus the title “Monsignor,” on August 7, 1970. A soft-spoken, kind businessman, he went about work quietly accomplishing much for the parish. On June 14, 1974, he invited Msgr. Bourgeois, who had just celebrated his 50th anniversary as a priest, to join him to “burn the note.” Sacred Heart School was debt free. Plans for a new rectory to replace the 50-year-old structure were put into effect. On the last day of the Nation’s Bicentennial Year, 1976, the pastor and his assistants moved into their beautiful new rectory. The school, which had opened 47 years earlier, continued to prosper under the capable direction of Monsignor Fruge. Also, while in Ville Platte, he set up the first church council at Sacred Heart on November 9, 1971. There had been a board of directors, but not a council as such. Members of this council were Father Grady Estilette, Father Gus Johnson and Trustees Harold Stromer, Sr. and Joe Feucht. Religious representative was Sister Myra Banquor. In July of 1982, Msgr. Fruge was transferred to Breaux Bridge and later to Jeannerette. He died while pastor at Jeannerette. A “Monsignor Fruge Fine Arts Building Fund” was set up as a memorial to him and is in the future plans of Sacred Heart School. The Sacred Heart School Foundation, established in 1981, is a non-profit corporation to receive and manage donations, memorial gifts and bequests of money and personal property for the benefit of the Sacred Heart School in Ville Platte. Rene A. Tate was elected the first president of the Foundation. Other elected Foundation officers included Percy J. David, vice president; Terryl J. Fontenot, secretary; and Norbert M. Vidrine, treasurer. The Board of Directors included Robert Buroker; Charles L. Buller; A.B. Coreil; Thurman H. Floyed; Eugene S. Fontenot; Dwight E. Lafleur; John W. Powell, Jr.; James Curtis Soileau; James Floyd Soileau; Michael K. Veillon; and Drouet W. Vidrine. Father Francis Bourgeois was sent to Ville Platte in July 1982 to replace Monsignor Fruge. After a short time he was forced to resign because of health problems. He was replaced by Father Michael Jarrell, a native of Opelousas, in January of 1984. In 1987, Father Jarrell was named Vicar of the Northern Deanery and a member of the College of Consultors. In 1988, he was invested as Prelate of Honor with the title of “Monsignor” by Bishop Gerard Frey. He was also a member of the Continuing Education Committee and the Diocesan Personnel Advisory Board. He had cooperation from the Parish Council and the School Board and was able to build on the foundation of the past and charge into the future with confidence and support. Father Jarrell initiated many new church-related services such as: a financial committee to advise the pastor of parish needs, the “Each One Reach One” group for young people, and a community service center to help the needy, which in May of 1985 developed into the present-day “Care and Share Center,” located on Main Street. 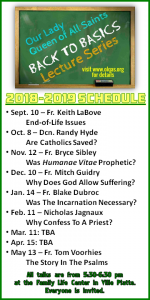 Under his direction, classes for parents prior to baptism of children, RCIA (Rite of Christian Initiation for Adults) program, began in March 1985. Father Jarrell introduced the “Right to Life” program in 1991. He also made notable church improvements including installation of new and improved lighting in the church building, a church “cry-room,” and resurfacing of the church parking lot. Upon leaving Ville Platte, he stated that he would like to be remembered as a pastor who loved his people. 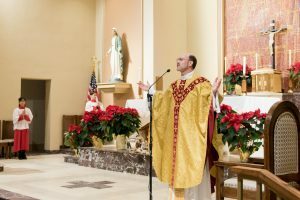 His parting words were, “With good leadership, both clerical and lay, strong support of parishioners, and the grace of God, Sacred Heart Church will continue to bring Christ to the people of Ville Platte as long as there are people to receive Him.” Msgr. Jarrell was ordained Bishop of the Houma-Thibodeaux Diocese on March 4, 1993. 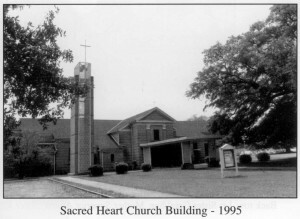 In 1987, the Holy Spirit Chapel in the Vidrine Community was temporarily under the administration of Sacred Heart, but was returned to the Saint Ann Church Parish in Mamou. On March 3, 1990, the Fiftieth Anniversary of Belaire Cove Chapel was observed with a special Mass followed by a reception at the church hall. Msgr. Irving DeBlanc was the principal celebrant and homilist with Father Michael Jarrell serving as concelebrant. Sister Elsie Vidrine, a Ville Platte native and member of the Marianites of the Holy Cross Society and an employee of Humana Hospital, understood the importance of the spiritual aspect of coping with illness, death, and dying as well as the necessity of medical treatment. In 1987, with the help of hospital volunteers, she began soliciting funds for a hospital chapel. The chapel was soon a reality and was housed in a patient room. Mrs. Dulcie Dupre donated the altar that was originally used in the first Sacred Heart Church and had been acquired by her some years earlier. Mr. Orise Fontenot refurbished the altar, which is still in the chapel to this day. Although the chapel was formally dedicated in August 1987, it was not designated as a Perpetual Adoration Chapel until November 1992. In 1996, a fund raising drive for a new chapel to be built on the north side of the hospital, which was now a publicly-owned, non-profit hospital known as Ville Platte Medical Center, began and was spearheaded by Ville Platte Medical Center Volunteers President Janell Tate. Ville Platte Medical Center assisted in the planning and raising of funds. The goal of $75,000 was reached, with approximately $22,500 donated by Cabot Corporation alone. Many other generous donations were received and a new Perpetual Adoration Chapel became a reality. The all-denominational chapel was dedicated in August 1999 with one section used for private prayer by all religious denominations and one section used for Adoration of the Blessed Sacrament. The final phase of the chapel was completed in August 2000 when several additional large donations made possible the installation of stained glass windows, depicting appropriate Bible scenes and symbols of the medical profession. A local artist, Patrice Colligan Hemmi, is credited with the design of the windows. On February 7, 1993, Father J. Robert Romero, a native of Abbeville, was appointed Pastor of Sacred Heart of Jesus Church by Bishop Harry Flynn. He replaced Bishop Jarrell who had recently been appointed Bishop of the Houma-Thibodaux Diocese. In addition to being pastor of Sacred Heart Church in Ville Platte, which includes the Belaire Cove Mission Chapel, Father Romero was also named Sacramental Minister of St. Joseph Parish Church, and Episcopal Vicar of the North Region of the Diocese. He was appointed moderator of the Secretariat for Family Life Services in 2002. In October 1993, the first Sacred Heart of Jesus Church Parish pictorial directory was published and distributed to parishioners. In 1996, new church pews were installed. While the old pews were removed, Father Romero took advantage of the situation and had extensive general maintenance work done in and around the church building. 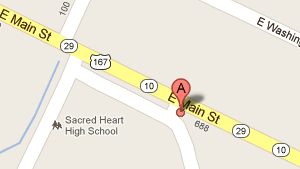 During this time, Sunday Masses were held at the Sacred Heart High School gymnasium. Under the sponsorship of the Ville Platte Knights of Columbus Council No. 1754 and the Catholic Daughters of America Court Sacred Heart of Jesus No. 1764, a drive to raise funds for a pro-life Memorial to the Gospel of Life was conducted in 1998. As a result of this successful effort, a nine-foot Memorial consisting of a block of granite upon which stands a statue of the Blessed Virgin Mary holding the Infant Jesus is located on the northeast lawn of Sacred Heart of Jesus Church. The Memorial became a reality as a result of the combined efforts of the parishioners of Sacred Heart of Jesus, Belaire Cove Chapel, Our Lady Queen Of All Saints and St. Joseph Church. Around the statue, flowerbeds and granite benches enhance the scene for beauty and personal meditation. The memorial was dedicated on November 7, 1998, by the Assistant to His Holiness Pope John Paul II, His Eminence Pio Cardinal Laghi, Prefect of the Congregation for Catholic Education. In October of 1999, Father Romero was named Prelate of Honor to the Holy Father, Pope John Paul II, with the title of “Monsignor”. On November 19, 1999, the Most Reverend Edward O’Donnell, Bishop of the Diocese of Lafayette, presided at a special Sacred Heart School Mass which was a Mass of the investiture of Monsignor Romero as a Prelate of Honor to His Holiness, Pope John Paul II, Supreme Pontiff. Through a proclamation of Pope John Paul II, the universal church began the celebration of the year of Great Jubilee on Christmas Eve, 1999. This marked the beginning of the Third Millennium of the founding of Christianity. 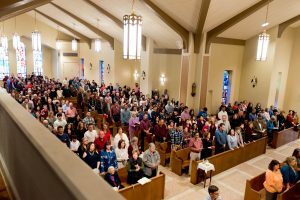 Bishop Edward J. O’Donnell, the fifth bishop of Lafayette, proclaimed Sacred Heart of Jesus Church Parish in Ville Platte one of the eleven diocesan churches as a pilgrimage church during this celebration. On March 14, 2000, Rev. Msgr. J. Robert Romero celebrated his Silver Jubilee (25th year) of ordination to the priesthood. A new processional cross was donated to Sacred Heart in the year 2001 by the family of Mr. and Mrs. Alcius Fuselier. This “Savior Cross” is a reproduction of the processional cross used for the 1995 Papal Mass at St. Joseph Seminary Dunwoody, Yonkers, New York. Sacred Heart Cemetery Mausoleum was expanded in 2002 when the Acme Mausoleum Corporation built a new addition on the west side of the cemetery. This undertaking was completed in December 2002. 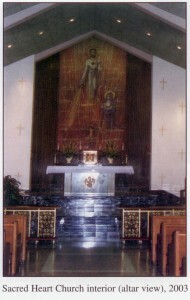 A major renovation of the sanctuary of Sacred Heart Church took place from March through August of 2002. Stan Gall, Jr., Inc. of Crowley was the principal contractor, and Roland St. Lawrence, Sr., a subcontractor, removed the carpet and installed marble tiles in the entire sanctuary and installed a marble pulpit to match the altar and baptismal font. The tabernacle was refurbished and regilded. At this time, two public address systems, one for the main body of the church and one for the choir loft, were installed. On both sides of the altar, handrails were installed in the church from the main floor leading up into the sanctuary. The renovations were completed in 2002. During this extensive renovation, the Blessed Sacrament was kept in the tabernacle on the Blessed Mother’s altar and Mass was celebrated in the main aisle of the church. In May 2002, Sacred Heart Church Parish began participating in Radio Maria, broadcasting worldwide weekday masses from Monday through Friday at 6:30 am. This made hearing Mass possible to the sick and shut-ins of the parish. 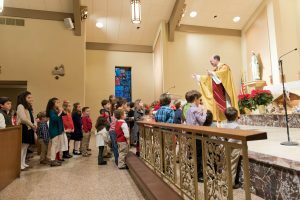 In April 2003, a new Vocation Prayer Program was initiated at Sacred Heart Parish. Its purpose was to encourage families to devote and set aside a special time of prayer and meditation for vocations to the religious life. Each week, one family volunteers to receive the special cross at Mass. This crucifix is then taken home where family members gather each day to recite a special prayer for vocations. On June 5, 2003, Bishop Michael Jarrell made a pastoral visit to Sacred Heart of Jesus Parish, celebrating Mass in the Sacred Heart Church. A reception was held in the Sacred Heart Meeting Room following the Mass to welcome Bishop Jarrell home to the Diocese of Lafayette. Commemorating the 25th Anniversary of the death of Msgr. Maurice J. Bourgeois, a memorial Mass was celebrated on June 14, 2003. Msgr. Irving DeBlanc, the first Associate Pastor at Sacred Heart who served with Msgr. Bourgeois, was invited to be the guest homilist. On June 29, 2003, the Annual Diocesan Marriage Celebration to honor couples who have been married 25, 40, 50, 60, or more years was held at Sacred Heart Church in Ville Platte. Bishop Michael Jarrell celebrated the Mass and presented certificates to all 70 couples participating. The Catholic Daughters sponsored a reception following the Mass for honored couples and their families. Sacred Heart of Jesus, with its mission church in Belaire Cove, has approximately 1,500 families. In 2005, Ville Platte native, Fr. Eugene Tremie, was named pastor of Sacred Heart of Jesus. Three newly ordained associates served with Fr. Tremie: Fr. Michael Delcambre of Abbeville, from 2005-2007, Fr. Joshua Guillory of Kaplan, 2007-2009, and Fr. Clinton Sensat of Scott, 2009-2011. On July 1, 2011, the Solemnity of the Sacred Heart of Jesus and the patronal feast day of Sacred Heart Church, Fr. Joshua Guillory, former associate of Sacred Heart, took over the pastoral governance of the parish from Fr. Tremie, who was named pastor of St. Marcellus Parish in Rynella, La. Fr. Guillory had been away from Sacred Heart for only two years, completing his canon law studies in Rome. Fr. Garrett McIntyre of Bayou Vista was named Associate at the same time. This was Fr. McIntyre’s first assignment as a newly ordained priest. In June of 2013, Fr. McIntyre departed Sacred Heart as the new Associate Pastor of Our Lady of Wisdom on the UL Campus. Succeeding Fr. McIntyre as the Associate of Sacred Heart was newly ordained Fr. Brian Harrington of Lafayette. A few months later, Fr. Joshua Guillory was called to serve in the Apostolic Signatura in Rome. Bishop Jarrell released him, and Fr. Guillory departed in October of 2013. Fr. Jason Vidrine was appointed Pastor of Sacred Heart Church on November 1, 2013, the Solemnity of all Saints. A second native of Ville Platte, who similar to longtime Pastor, Fr. Bourgeois, arrived at the age of 32, Fr. Vidrine came from St. Peter the Apostle Church in Gueydan, LA, where he had served as Pastor for nearly five years. With the help of a Building Committee begun by Fr. Guillory, Fr. Vidrine led the project to repair and restore the exterior of the church, including the changing of the roof and fascia boards, repairing and sealing of the bricks, replacing of the rear doors, and repairing and cleaning of the Stained Glass Windows. At the encouragement of some parishioners and members of the community, Fr. Vidrine prayed the Eucharistic Prayer in French at the Thursday morning Mass each week, paying homage to the ancestors of the parish and community and joining the efforts to preserve the language and culture of Ville Platte. Fr. Thomas Voorhies was made pastor on July 6, 2015. He was previously pastor at St. Peter and Paul Church in Scott, La. Like his brother, Fr. Bennett J. Voorhies, Fr. Tom moved 30 years later from Scott to Ville Platte. Under Fr. Tom, the interior of the rectory was renovated in 2016, including new floors, lights and a fresh coat of paint. In June of 2017, the renovation of the Church interior began. All weekday Masses were celebrated in the high school chapel and weekend Masses in the high school gymnasium. Some of the changes included: new light fixtures, new A/C & heater system, new lighting system, removal of the woodwork on the altar, painting the stations of the cross, a new statue of our Blessed Mother (Our Lady of Grace), restoration of Our Lady of Fatima statue and St. Joseph statue. 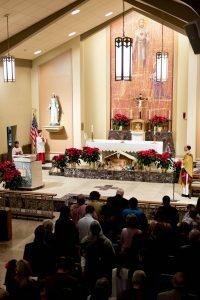 The renovations were finished just in time for Christmas Eve Mass 2017, truly a Christmas miracle for the parishioners of Sacred Heart. Fr. Tom’s associates have been: Fr. Matthew Barzare (2015-2016); Fr. Taj Glodd (2016-2018) and Fr. Blake Dubroc (present).